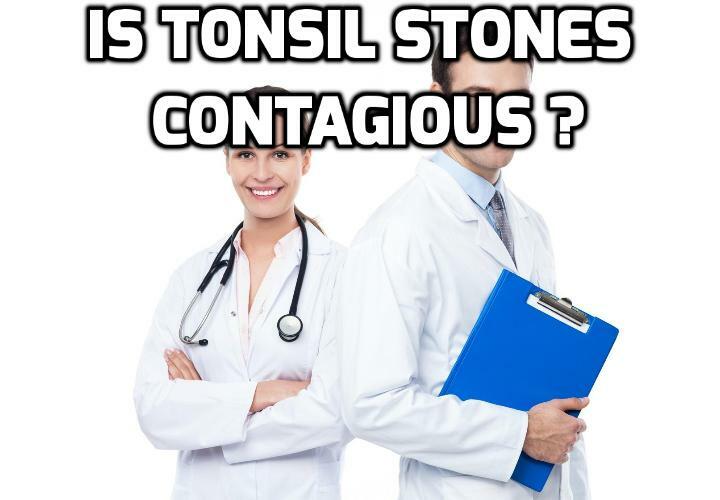 In What Ways Can Tonsil Stones Be Contagious ? Individuals with tonsil stones experience the build-up of dead cells, food particles, saliva, and microorganisms in the crevices of their tonsils. Although tonsil stones themselves are not contagious, it is possible to transmit bacteria or other infectious agents to another person and increase their likelihood of developing tonsillar inflammation, which can lead to the formation of tonsil stones. If someone has tonsil stones that are easily dislodged, he or she has a higher chance of transmitting oral bacteria to others via saliva. Additionally, depending on the cause, inflammatory conditions such as tonsillitis may also be contagious and may lead to tonsil-stone formation. Mononucleosis, for example, is a viral cause of tonsillar inflammation that is highly contagious. Bacterial causes of tonsillitis such as those responsible for strep throat are also very contagious. Tonsillitis that is caused by allergies or sinusitis, however, is rarely transmittable to others. Tonsil stones are not regarded as contagious, but the bacteria from tonsil stones can be transmitted to another person through saliva. Actions such as kissing or sharing eating utensils can make the sharing of oral bacteria more likely. However, although bacteria can be spread to others by these actions, it is almost impossible to develop tonsil stones as a result of contracting microorganisms from another person. The individual shape of your tonsils and your oral-hygiene habits are largely responsible for tonsil-stone formation. Your tonsils are two, oval-shaped lymphatic structures that are positioned on either side of the back of your throat. The tonsils are covered by a surface of pink mucosa, which contains pits and channels that are commonly known as the tonsillar crypts. When substances become trapped in these crypts and begin to decay, pale tonsil stones can easily form. Every person possesses a slightly different oral structure that can predispose him or her to debris accumulation and tonsil stones. As a result, you do not need to be concerned about contracting tonsil stones by a quick kiss or by sharing food. Furthermore, most bacteria and other microorganisms are conveyed through direct contact with an infected medium such as saliva or blood. Ultimately, the only way that you can acquire tonsillar bacteria is through direct contact. This is possible but unlikely, as most people do not touch their tonsils. Watch this Video – Tonsil Stones: Is Tonsil Stones Contagious? Next PostNext What Are The Causes Of Tonsil Stones?